Mobility in healthcare is here to stay. In fact, 90% of healthcare organizations recently survey in our global research study either have implemented or plan to implement a mobile device initiative within the next two years. Additionally, of those organizations that have implemented a mobile device initiative, they have seen increases in key metrics, such as their patient experience scores. Curious where they’re implementing these devices? 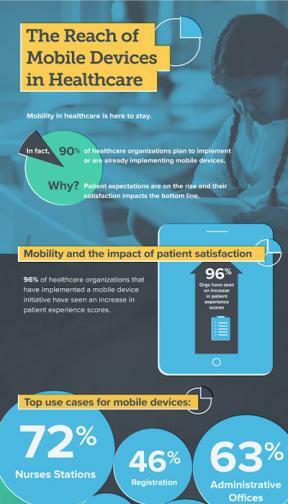 Download our infographic to find out the most common use cases for mobile devices in healthcare and the tangible benefits they are experiencing by adding mobility within their organizations.